The Dale milk cup tournament bringing spanish teams to play in Northen Ireland. 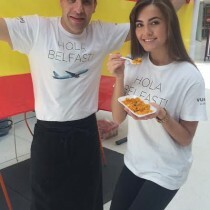 At the belfast city airport promoting the new Vueling airlines for a direct flight from Belfast to Barcelona. THE TAPAS … A way of food culture in Spain, all type of products mixed in perfect harmony and served in small amounts….The TAPAS… The Tapas is a world of fantasy that does not have any limits or opposition in the gastronomic environment. Love the food, would recommend!